It was a moody morning in mid-May. As the thickets undimmed in the waxing pre-dawn light and our small group gathered, a special feeling filled the air. I was leading a birdathon (a birding fundraiser). For it to be a success, I had to do more than identify birds; I had to hear and find them and decide which birds the group could observe (or identify). I also wanted to find “gee-whiz” birds and a stellar variety of species. My goals appeared to be within reach even before we took a step. I could hear plenty of calls in the warm, still air near the trailhead, indicating a good migration during the night before. At other times, I’ve hit a warbler day or a big day for migrants in general. I remember one mid-May morning when I found 98 species, including Yellow- and Black-billed Cuckoo, three species of nightjars, and a staggering 28 species of wood-warblers — and I was still finding great birds when I had to leave to get to work by 9 a.m. This day looked to be even better. And then the real magic began: The birds started singing. First a Wood Thrush tuned up, then a Veery or two. I heard a late Hermit and a Swainson’s. Hey, wait, wasn’t that a Gray-cheeked Thrush? And hard to believe, next was a Bicknell’s Thrush. All of the eastern North American thrushes were singing within earshot. Where was this special wilderness? We were in the Ramble, the wooded heart of Central Park, one of the premier birding locations in the United States. From the last week of April through the end of May, it attracts a wealth of colorful and sought-after short-distance and neotropical migrants. The big park in the Big Apple is where they drop in to refuel on their way from somewhere south (perhaps South America) to somewhere north (possibly the boreal forests of Canada and the northern United States). 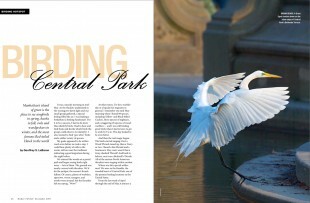 The best birding sites are located in the southern half of Central Park. The three park entrances below offer the quickest access to the hot birding areas. 1. East 59th Street and Fifth Avenue: Served by subway trains N, R, and W. Three blocks east, trains 4, 5, and 6 stop at Lexington Avenue. 2. East 72nd Street and Fifth Avenue: The closest subway stations are at 63rd Street and Lexington Avenue (train F) and at 68th Street and Lexington (train 6). 3. West 81st Street and Central Park West: Served by subway trains B and C at the American Museum ofNatural History stop. One reason the park is so attractive to birds is its location. A significant island of natural green habitat in a city of 8.2 million, it is surrounded by hundreds of square miles of buildings and pavement. 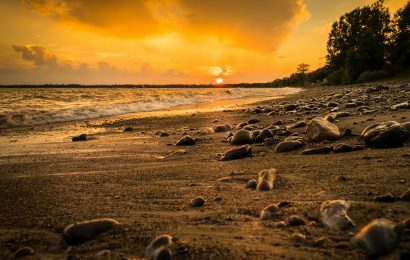 The fact that New York is a coastal city amplifies the island effect. When migrant birds move northward over water and up the coast overnight, they grow tired and hungry and are ready to seek refuge and food at first light. Central Park is perfectly situated to entice them. Thanks to the genius of park designer Frederick Law Olmsted, the birds find blooming plants and emerging insects and a remarkably varied landscape, including many ponds and marshes (often with exposed mudflats), large grassy areas, mature stands of deciduous and coniferous trees, and a tremendous amount of shrubbery and flowering ornamental plantings. The park has something for nearly everyone in the bird kingdom. Given its general attractiveness to birds and the large number of birders, it’s no wonder that a wide array of rarities has been recorded. Summer Tanager, Prothonotary Warbler, Swainson’s Warbler, Painted Bunting, and Clay-colored Sparrow have all occurred in spring, and a Rufous Hummingbird delighted birdwatchers a few winters ago. So keep your eyes and your mind open. One bird you’re sure to see is the abundant European Starling. No surprise, of course, because Central Park holds the dubious distinction of being the starling’s launch pad. Fans of Shakespeare released the bird into the park in the 1890s as part of a plan to introduce to the New World all of the Old World species mentioned in the Bard’s plays. Within 60 years, the bird had reached the shores of the Pacific. You won’t find people releasing Shakespeare’s birds in the park anymore, of course, but you can see his plays each summer at the outdoor Delacorte Theater, located east of West 80th Street. At the four-acre Shakespeare Garden a few paces to the south, you’ll find the plants mentioned in his plays and poems. Watch for a great diversity of birds here, often within close viewing range. Directly east of the garden stands Belvedere Castle, a Victorian structure that houses the Henry Luce Nature Observatory. In addition to providing a fantastic view of the park and the surrounding city, it displays bird skeletons and feathers and offers kits with binoculars, notepaper, and other items for children to use at nearby Turtle Pond or the Ramble, the center of birding activity in the park. Belvedere Castle is also a good spot to watch hawks in the fall. The full complement of eastern raptors passes overhead, especially when northwest winds push birds to the coast on late September or early October days. The peak of the southbound Broad-winged Hawk migration is usually in late September. Hundreds of Cooper’s and Sharp-shinned Hawks, Ospreys, Bald Eagles, Red-tailed and Red-shouldered Hawks, and the three expected falcons — American Kestrel, Merlin, and Peregrine — continue for a few more weeks. Numbers drop off later in the season, but Rough-legged Hawks or even a Golden Eagle have been spotted in late October or early November. 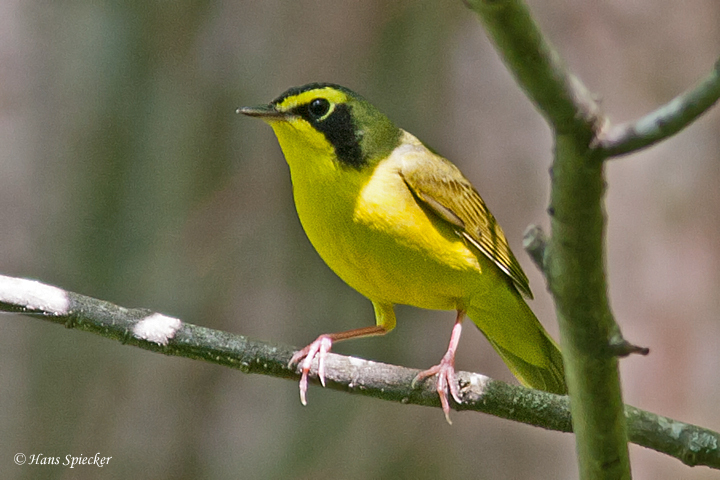 Songbird migration in the fall isn’t as spectacular as in spring but still productive. Flocks of “confusing fall warblers” fill the trees, presenting a wonderful opportunity to study and learn. You never know what will show up. I remember walking along a path on the southeastern side of the park early one December morning flushing House Sparrows, when a blazing orange male Baltimore Oriole suddenly appeared. As fall turns to winter, birds look to Central Park as a haven. A handful of Red-headed Woodpeckers, usually brownish birds of the year, spend the season. Birders who don’t mind the cold have the opportunity to watch them as they parry with local resident Red-bellied Woodpeckers for acorns and roosting cavities. Toward spring, they molt into their bold adult plumage: red heads, dark-tipped chalk-blue bills, white bellies and wing patches, and black backs and tails. Other birds find cover and food in the park during the cold months, too. Dense stands of coniferous trees near open areas and a good supply of small rodents attract owls. Roost locations are kept confidential to preserve the birds’ solitude, but keep an eye out for Great Horned, Long-eared, Barred, Eastern Screech-, and Barn Owls just about anywhere in suitable habitat. You may also find Northern Saw-whet Owls and other elusive species. In fact, a few seasons back, a birder on the Lower Hudson New Jersey-New York Christmas Bird Count stumbled onto one of the best sightings in recent memory. Relegated to what he thought was a less desirable area near Tavern on the Green at West 66th Street, he found what he thought was a saw-whet owl. It was later determined to be the city’s first ever Boreal Owl. As noted in this magazine in April 2005, the owl was one of thousands of Canadian birds found in northern states the previous winter. Watching migrating hawks is fun wherever you do it, but it’s especially memorable in Central Park. From the top of Belvedere Castle, you can see hawks, eagles, and falcons flying past. “Raptors are ambassadors to nature,” says Bob DeCandido, the ornithologist who ran the park’s official hawk watch until 2001. An official count is no longer kept, but birders still climb the steps on fall days when winds blow out of the northwest — conditions that are perfect for spotting raptors. You can, too. It’s pretty unusual to find a mega-rarity, but it’s fairly easy to see the park’s celebrity bird. Pale Male, arguably the most famous wild bird in the world, lives in and just across the street from Central Park. The Red-tailed Hawk has been a New Yorker since 1991. He and his first mate attempted to nest in trees in the park, but they were harassed by hordes of American Crows and their nest fell down. The hawks soon renested in a new location, weaving sticks onto the spiked, metal pigeon guard above the window of an apartment standing across Fifth Avenue at East 74th Street. Pale Male, the first Red-tailed Hawk to call Central Park home, has had four mates since 1991 and has fledged 23 chicks. He and mate Lola typically begin mating in early February. First eggs appear March 5-15. The last three years’ nests have failed, but in previous years, eggs hatched in mid- to late April. The young hawks fledge in early June. Appalled at the remains of pigeons, rats, and other half-eaten prey items that rained from the hawks’ nest, the building managers ordered it removed in late 2004, provoking a huge public outcry. After loads of media attention and a threat of legal action by national conservation organizations, the managers relented, and the hawks were allowed to renest (with nets strategically placed to catch the table scraps). Pale Male and his fourth mate, Lola, still nest there today. You can view them and their aerie from the path on the west side of Conservatory Water, a small pond known to locals as the Model Boat Pond. 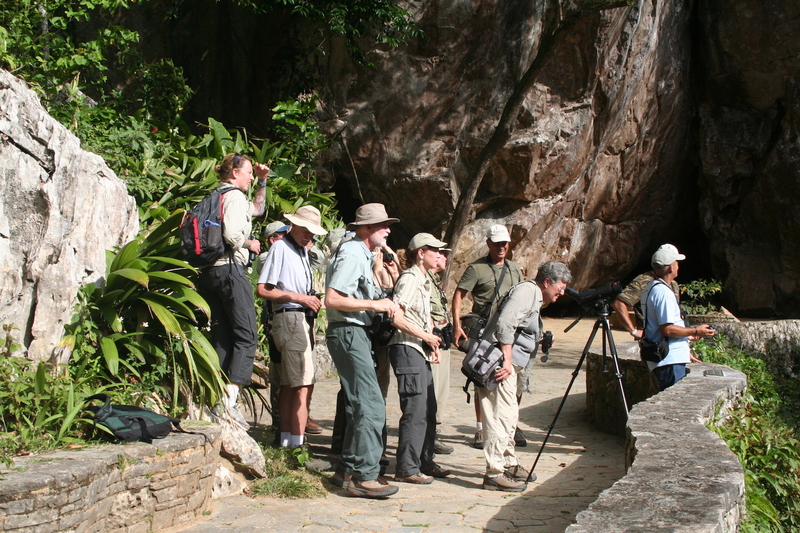 Coincidentally, the place to spy the nest is also one of the best spots for birders to enter the park. From East 72nd Street and Fifth Avenue, walk along Park Drive North to reach the Loeb Boathouse, home to rentable rowboats and bicycles and a Venetian gondola. The Bird Register, a loose-leaf notebook that anyone can report bird sightings in, is kept at the boathouse. Check the book for the latest bird news, or leave a note on the birds you’ve seen. The forested area just north of the boathouse is the celebrated Ramble, 37 acres of hills extending from 72nd Street to 79th Street. It is the place to be in spring. Paths wind through woods and thickets, along the Lake, over Bow Bridge, and back to the boathouse. If you work the paths slowly, you’ll find an amazing variety of birds at close range. Wet spots and seeps can be especially attractive for weary migrants in search of a bath. • The back wall of the Central Park Zoo, on the east side between 63rd and 66th Streets. It’s where I saw my December Baltimore Oriole. • The Great Lawn, an oval green space in the middle of the park. Look for Red-tails hunting from the surrounding trees. • The large body of water known as the Jacqueline Kennedy Onassis Reservoir and the adjacent Bridle Path, in the middle of the park. Watch migrant and sometimes wintering waterfowl (until freeze-up) along the reservoir margins. For a bit of culture when you’re done birding, visit the Metropolitan Museum of Art on the eastern edge of the park at East 82nd Street. And the incomparable American Museum of Natural History is on Central Park West between West 77th and West 81st Streets. Strawberry Fields, the memorial to John Lennon, is located inside the park’s western edge at West 72nd Street. The birding in the tranquil gardens around Strawberry Fields can be excellent, although busloads of tourists will quickly drive birds into the underbrush. You may hear that Central Park has a reputation for crime, but in fact at most times, it is perfectly safe. Lots of people are out and about most mornings and afternoons, and early mornings in spring bring out birdwatchers of all stripes, including suit-clad professionals carrying both briefcases and binoculars. Best of all, it amazes me how quickly the sounds of traffic, horns, and sirens fade away within a few yards of the park’s edge. We birders do find great birds here, even life birds, but perhaps more important, we get front-row seats at a never-ending production about the resilience of nature in the heart of our largest city. And we don’t even have to buy tickets. Geoffrey S. LeBaron is the director of the National Audubon Society’s Christmas Bird Count. He wrote about birding Sachuest Point National Wildlife Refuge in Rhode Island in our February 2007 issue.